Binoculars are one of those things that people find really fun and cool, but sometimes don’t know what to do with. Or what all the numbers mean. Or what all the weird terms are. Why do I even need these? Well, for certain kinds of photography they can be incredibly important. For example, if you want to take pictures of wildlife, you have to find it first and binoculars can help with that. First, let’s dissolve some of the confusion and give you a clear view of why these gadgets are so handy. When looking at binoculars, you’ll notice there’s numbers everywhere like they’re supposed to mean something. Well, they do. These numbers, like 8 x 42 or 10 x 50, aren’t just multiplication. They represent the amount of magnification the binocular provides and the diameter of the front objective lens which is responsible for gathering light. Magnification x Objective Lens Diameter - So for 8 x 42 binoculars, you know you’re getting 8x magnification, with a 42mm objective lens to capture light and transmit the scene to your little eyeballs. Obviously, a larger objective lens can gather more light, meaning you’re able to view a brighter image. But bigger doesn’t always mean better. Remember, you have to carry these things around. Great, got it. Now what? Now we’ll get into a few other terms you might encounter when searching for the perfect pair of binos. Yes, there’s more than just magnification and objectives, so strap in for a quick breakdown. Field of View – Exactly what it sounds like. It’s how much of the scene you can see when looking into the eyepieces. It’s good to note that as the magnification increases, the field of view decreases, so going with high magnification isn’t the be-all and end-all. If your main use will be general viewing or spotting good locations and wildlife, having a wider field of view is ideal. It’s also better for tracking faster-moving animals which are challenging enough to catch in the first place. We’ve all noticed this little bright dot when we hold up a pair of binoculars. Exit Pupil – A virtual aperture that light passes through to reach your eyes. Just like a lens with a camera. Except in this scenario, the camera is your head. If you’ve ever held a pair of binoculars away from your face, you’ve probably noticed a little bright dot in the eyepieces. That’s the exit pupil and yes, there’s maths to calculate its size. Example: 8 x 42 binoculars would be 42 ÷ 8 = 5.25mm exit pupil. Cool, why does this matter? Well, just like some lenses are better in low light, the same is true for binoculars. Wider exit pupils send more light to your eyes which is better in dim lighting. It isn’t as much of a factor for daytime use, but at dawn or dusk, a larger exit pupil will help. 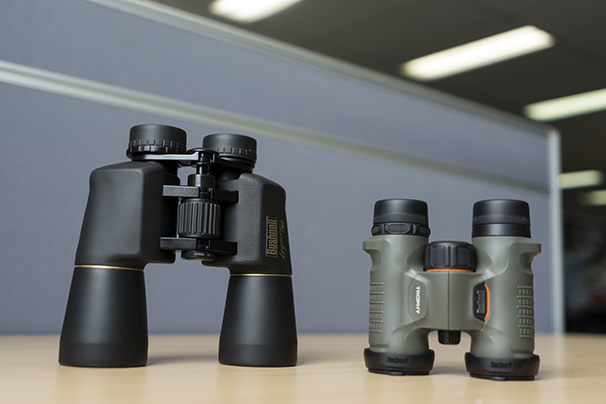 Pretty easy to spot the difference between Porro prism binoculars (left) and a pair with roof prisms (right). Prism Type –Binocular optics use either roof or Porro prisms. Usually, you can tell by how they look; if the eyepieces and objectives lenses are in a straight line, they’re roof prisms. If the objectives are wide-set and not aligned with the eyepieces, the binoculars are Porro prism based. In the past, Porro prisms were the way to go for image quality as they could reflect more light and provide a much clearer, brighter image. Their design, however, makes them a bit heftier, so they’re not always the most portable option. Roof prisms are positioned in parallel with the lenses and eyepieces, meaning the body size can be more compact. The downside of this style was that it used to reflect less light, so image quality wasn’t the brightest. Nowadays, the choice mostly comes down to cost. With the introduction of lighter weight materials and more reflective prism coatings, both styles can perform similarly. If you’re looking to save a few bucks without compromising on image, grab a pair of Porros and for portability, look into some good roof prism based models. Phase Shift – This applies to roof prism binoculars. If you’re leaning toward this style, make sure you look for phase correction coatings. When light enters the optics and reflects off the prism’s multiple surfaces, the light becomes partially polarised and splits into two misaligned beams. Without corrective coatings, overall image quality will suffer from lower contrast and clarity, so you definitely want to make sure your chosen pair has the right coatings for a better and more accurate viewing experience. Image Stabilisation (IS) – Some binoculars have image stabilisation to minimise the appearance of shakiness and movement. This is a really great feature if they’re going to be used every day for critical viewing applications, like rescue spotting or even just to help reduce fatigue. Of course, some binoculars have a tripod thread, but if you’d rather go handheld, IS will make a world of difference. If you’re planning to go down this route, Canon has some of the best options available. We were lucky enough to get our hands on some and let me tell you, we spent a lot of time peering out our office windows and whispering “Wow…” when the stabilisation kicked in. In the above video, you can clearly see the huge difference it makes. Both the view and movement get much smoother and easier to track. The subject, on the other hand… kinda suspicious looking. To understanding what is happening internally with image stabilisation, Canon have put together this demonstration video of the moving parts inside of one of its binoculars. You may have noticed a common theme in the above terms and features. 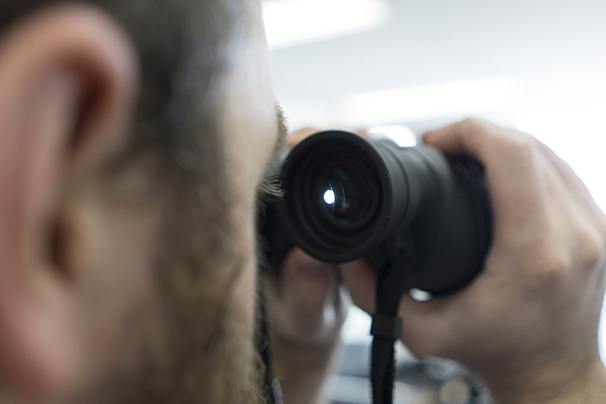 Much like cameras, some binoculars are more suited to certain applications than others. Choosing the right pair depends quite heavily on what your primary use will be, so it’s important to determine that before buying. A compact pair of roof prism binoculars, 8 x 32 or 8 x 40, is a reasonable starting point for the casual observer. These are easily portable and can be found more cost effectively while still offering a good amount of light transmission, magnification, and field of view. There are more purpose-built options out there, but that depends on you. Binoculars aren’t a requirement for any kind of photography, but they can sure as heck make it a lot easier to suss out good shooting locations or track and spot photogenic wildlife. Hot tip for all you astro-photographers out there! Binoculars make a great celestial object spotting tool. Of course, binoculars aren’t just for spying on animals. 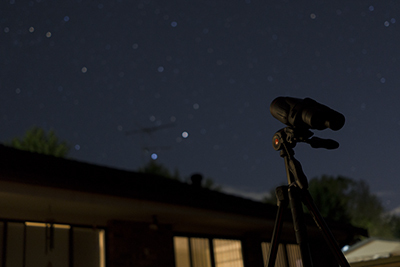 Certain models work well for other cool hobbies, like stargazing, and make an awesome companion for a telescope or camera. A photographer’s arsenal can seem endless, but once you make the jump towards a certain style, you start finding the little things that can make a big difference to your images. 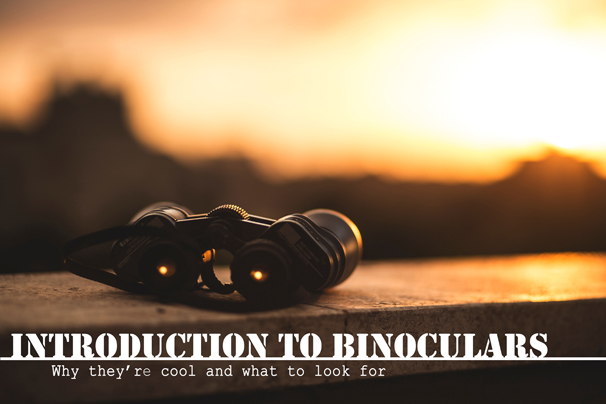 Hopefully this has helped demystify binoculars a little bit and given you a few reasons to think about getting some for yourself! If you’re up for more binocular chat and tips, give us a shout on our social media channels!